Funding of highway and public transportation system maintenance has shifted from the federal government to the states, causing a “devolution” of U.S. highways. As a result, necessary bridge and highway maintenance projects are delayed, state governments are making cuts to cover maintenance and new road projects, and state and local governments are implementing more tolls to help fund these projects. Overdrive, a trucking publication from Randall Reilly, recently conducted a survey to find out how these changes are affecting the trucking industry. Of respondents, 38.62% said that the poor condition of some roadways is increasingly taking a toll on their equipment. Now more than ever, it is important to invest in high-quality trucks that can withstand the elements, reduce maintenance, and prevent driver fatigue. Strong cab joints and rivets: High-strength cab joints prevent movement between panels, creating a sturdier and quieter cab. They also are more durable in the event of an accident. Windshield and hood slope: A wide, one-piece windshield and low hood slope for maximum visibility allow drivers to spot poor road conditions before it’s too late. Comfortable seats: Cushioned seats with good suspension help keep drivers more alert and energized, especially when dealing with a lot of bumps and cracks in the road, or sitting in stalled traffic in construction zones. Steering-wheel-mounted cruise controls: Having cruise controls right on the steering wheel makes it easier for drivers to adjust cruise speed and respond to changes in traffic. LED headlight system: The new system delivers industry-leading performance in the areas of light output and uptime. Utilizing an industry-first full-LED system, the new headlight incorporates LEDs in the low beam, high beam, daytime running lamp (DRL), park lamp and turn signal lamps. Optional tire pressure monitoring system (TPMS): Equipping your truck with sensors that monitor each tire’s pressure and temperature alerts the driver to small leaks or punctures ahead of major tire failures. Investing in high-quality, ergonomically friendly cabs has both long- and short-term benefits for fleet managers and owner-operators. In the long term, trucks are better able to withstand wear and tear, require less maintenance, and driver health is preserved by preventing back pain and general fatigue. In the short term, driver comfort leads to improved productivity and safety. Are poor road conditions taking a toll on your trucks? 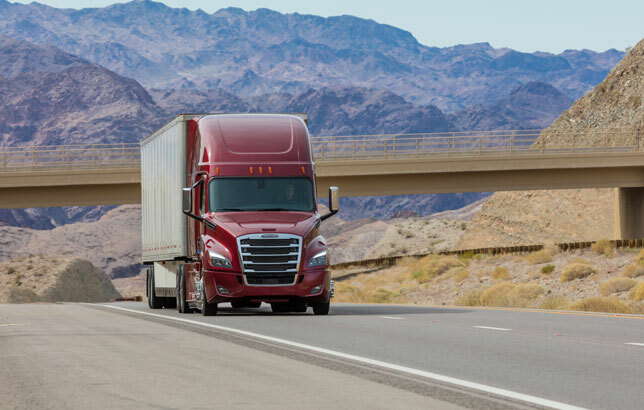 Freightliner trucks are manufactured with robotics and automated systems for precise builds, and are tested with industry-leading quality control. Learn more about the new Freightliner Cascadia®.